The Citizen has rallied the people to his side and given them a chance to judge the one percenters. Now, “Mr. One Percenter” himself, Oliver Queen has been called out, and must find a way to avoid being punished for his past mistakes. 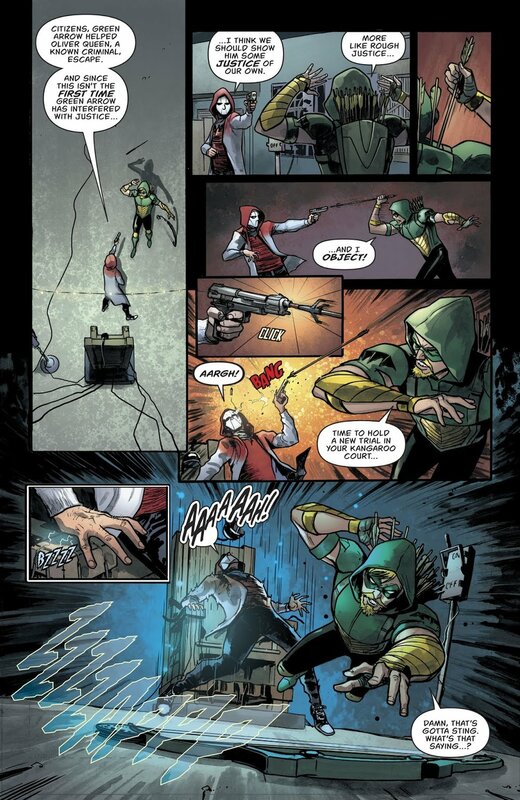 Green Arrow issue #47 is written by Julie Benson and Shawna Benson, with art by German Peralta, and colors by Josh Kalisz. Previously Green Arrow and Black Canary joined forces, to prevent an outrage of mobs from assaulting the higher class citizens of Seattle. As the investigation into the Citizen became deeper, Green Arrow learns from a crooked sheriff how the information about Oliver Queen was leaked. Meanwhile Black Canary has dug into the past attacks caused by the Citizen in order to figure out his identity. However, Citizen seemed to be further ahead than the duo, and succeeded in taking Oliver Queen hostage. The Citizen has placed the kidnapped Oliver Queen on the stands, in an electric chair, and urges the people internationally to judge Mr. Queen and Queen Industries’ wrong doings. As the villain ushers the people to make a decision about Queen, Black Canary provides a way out for Mr. Queen, and gives Green Arrow time to shut down the Citizen’s operation once and for all. With the world watching, Green Arrow pleads for the people to stand up against the heinous acts of the world in other ways, and to not follow the lead of one maniac on social media. Shawna Benson and Julie Benson have written a purposeful and impactful Green Arrow story in Citizen’s Arrest, showing how the usage of social media can give any regular person the ability to stand at a zenith-like monument for a short while. Though the Citizen shared a rougher version of Green Arrow’s beliefs, it is powerful to see how that same belief could be carried out in various ways, each resulting in putting power in the hands of the people. This story, further showcases the character as a meaningful hero for the people. The illustrations provided by German Peralta remain strong as the issue moves at a fast pace through quite a bit of action sequences. Peralta does a great job capturing the facial expressions of the cast as real emotions pour out through them, as well as providing a wonderful look at Black Canary in the Green Arrow outfit. The colors provided by Josh Kalisz were dark and dull through the pages, and it worked exceedingly well with the tone of the story itself and the thoughts of Green Arrow as he remains in a rather dark place in his life. With Oliver Queen left questioning his legacy and attempting to move on from all of his past mistakes. This story truly displays how Green Arrow could have turned out had he chosen another path. It’ll be intriguing to see how the archer advances on down this new path, while he honors his comrades who are still with him and those who have moved on.